Powerful Plant Database - Anytime, Anywhere. Landscaper's Companion is the leading Plant Database. Our plant catalog has over 26,000 plants from around the world. Plants contain detailed information on USDA zones, sun requirements, mature sizes, water requirements, bloom times, and more. Take a quick browse. Landscaper's Companion plant catalog is fully searchable. Start with a simple name or plant type search, or combine fields to narrow down plants to find the perfect choice for any project. Our plant database contains over 21,000 full-color photos of plants, with more added every month. Browsing plants for your next project has never been easier. Landscaper's Companion lets you keep track of your own plants and photos. Use it to create your own private plant catalog, back by our powerful search and plant list features. Simplicity and ease-of-use makes Landscaper's Companion remarkable. You'll actually enjoy using it. Landscaper's Companion is availabe on iPhone, iPad, and Android devices. Organize client projects and plant lists while at your office and then show your landscape designs at your clients home or out in the field on your mobile device. Whether you're on Windows or Mac, it doesn't matter. Landscaper's Companion is available as a web application, accessed using only a web browser such as Internet Explorer, Firefox, or Google Chrome. If you don't like using your browser, take a look at our version for Mac. More Than a Plant Database, Landscaper's Companion has tools for Professional Landscapers. Manage landscaping projects with ease. Create client plant lists in minutes. Share your plant lists with clients and contractors without any mess. Always have your client projects, past, present, and future, in a fully-searchable and secure website and mobile app. After you've finished creating the perfect plant list use Landscaper's Companion to easily email it to clients. Send detailed plant information, including photos, to anyone with an email address. 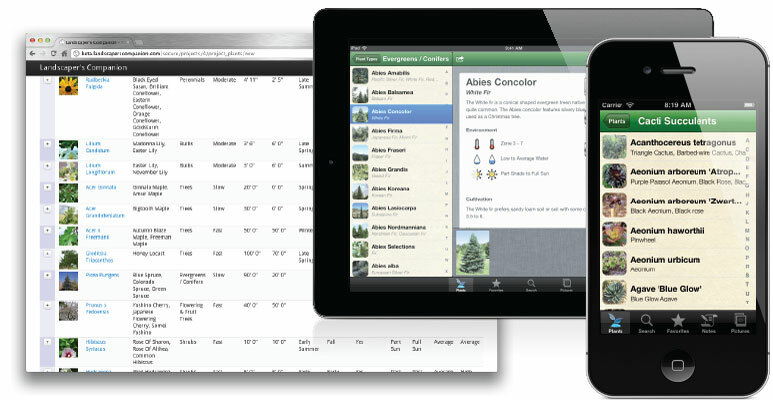 Landscaper's Companion has a comprehensive plant catalog and makes it easy to create plant lists. It saves me time and helps me serve my clients better.